Sequoia & Kings Canyon National Parks in California’s Sierra Nevada are often mentioned together as they are kind of siblings and neighbours. 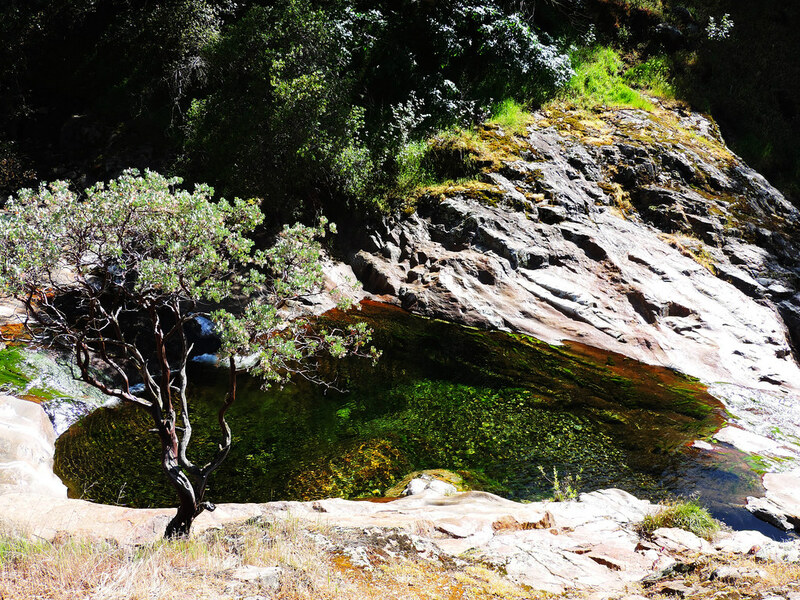 They are both paradises for hikers and nature lovers and we could definitely praise them for hours! Not to mention if we start talking about our favorite hikes and viewpoints or the biggest trees on Earth, the sequoias. Fear not (or fear), we will! 🙂 But for now we want to highlight something else. 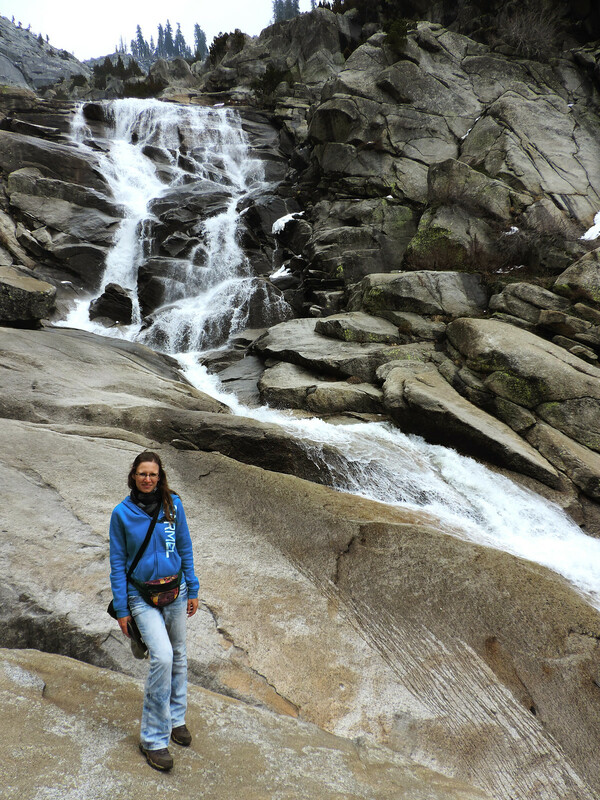 We’ve visited these parks during April and May last year and in case you don’t know it yet: late spring and early summer is the high season for waterfalls in the Sierra Nevada! Snow is melting, waterfalls and streams are rushing with water and they are basically everywhere. We wanted to take advantage of this magical period of the year and explore as many of them as we can. Here’s what we found in Sequoia & Kings Canyon National Parks: a bunch of lovely places accessible by short and easy hikes or walks and we are guiding you through them now. 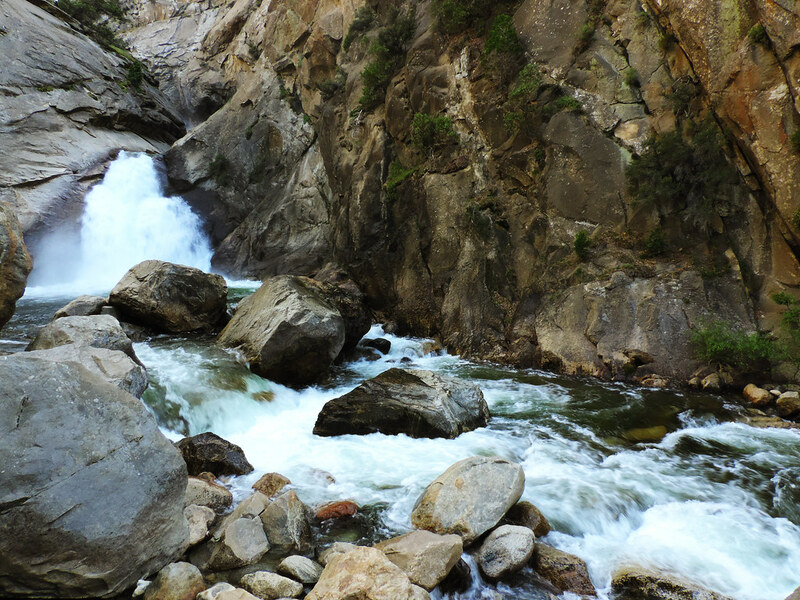 The lovely Marble Falls Trail is located in the Foothills area of Sequoia National Park. There’s a small parking area at the back of Potwisha Campground with the sign for the trailhead. This trail led us through the charming Foothills and all the wildflowers were in the peak of their bloom in April. Marble Falls it at the end of the trail, it has several smaller cascades and crystal clear pools between them. In addition, Marble Falls Trail is not one of the most well-known ones, we haven’t met many fellow hikers. We would definitely recommend to do it in April or May though not only because of the beautiful wildflowers, but also this low area gets incredibly hot in the summer. 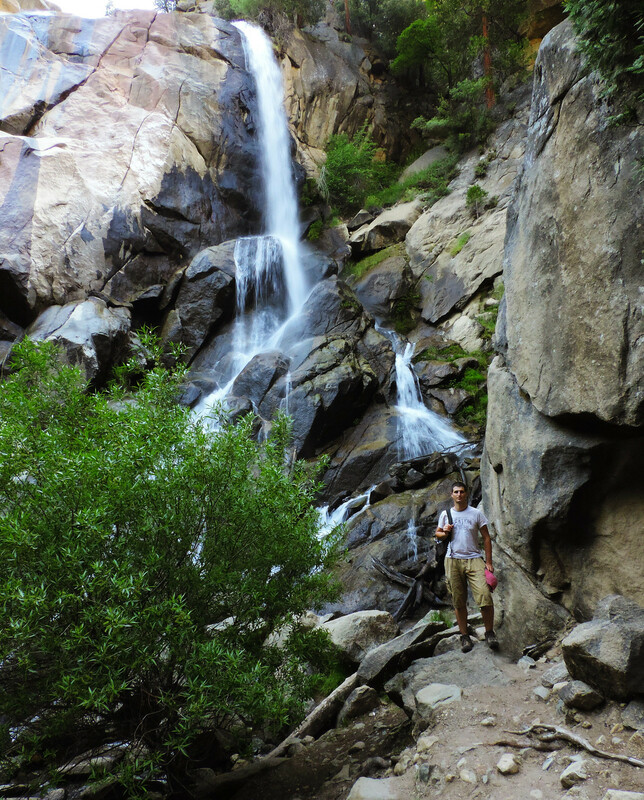 Tokopah Falls Trail is another magical and relatively easy waterfall hike! And it’s not only the waterfall that makes it special. It’s located in the higher Giant Forest & Lodgepole area of Sequoia National Park and it runs along a charming little stream enclosed by high granite peaks. The typical Sierra Nevada views! It ends at the 1200 feet Tokopah Falls. We did this hike in late April when all the surrounding peaks were still covered with snow and the temperature dropped below zero after dark. Late spring and early summer are the time of wildflower bloom here and this area won’t get so hot simply because of the elevation (above 7000 feet / 2000 meters). Paradise Creek Trail is again in the lower Foothills area of the Sequoia National Park and it runs along a crystal clear creek. There’s no named waterfall here, but there’s a lot of small waterfalls and pools along the way. Late April was a perfect time to see the wildflowers! Parking is a bit tricky, because the closest place where you are allowed to park is Hospital Rock Picnic Area. From there you need to walk down to Buckeye Flat Campground on the road and the trail starts from the campground. (You are not allowed to park at the campground unless you actually camp there.) Walking on the road is not the most comfortable and safest option, but it’s not a long walk, maybe 10 minutes. 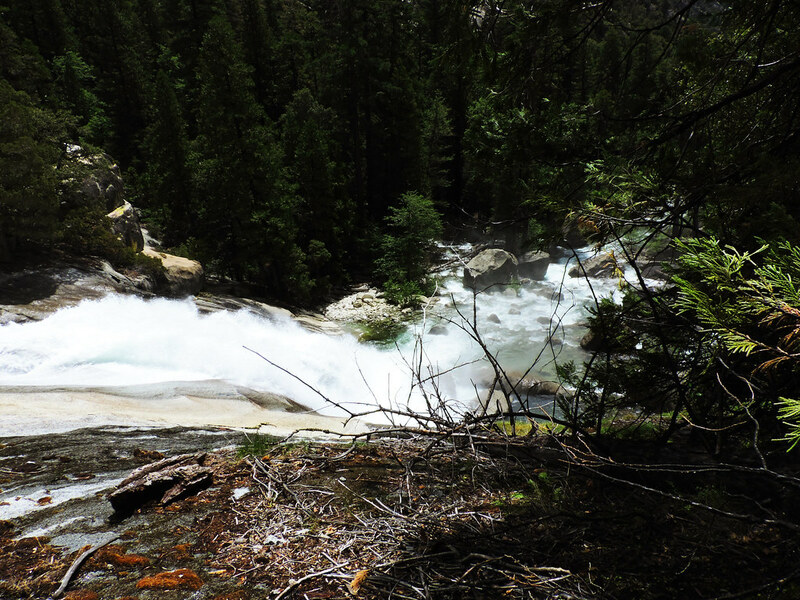 Most of the trails in Kings Canyon National Park are multiple day hikes and very remote, but one of the few day hikes is the trail to Mist Falls and Paradise Valley. This trail could be extended to the backcountry, too, but even its one day version was enough to impress us! I think this charming valley with the unbelievably green creek, its wildflowers and views of the above giant peaks deserves the name Paradise Valley. Mist Falls is at the end of the recommended day hike and it’s a beautiful cascading waterfall. The trailhead is an easy one to find: drive on General Highway (180) until you can. 🙂 There will be a dead end with a parking lot and that’s where you find Paradise Valley. Not much before the end of General Highway there’s a small parking lot indicating Roaring River Falls which is only a couple of minutes walk from the parking lot. Not much effort for a very nice reward! 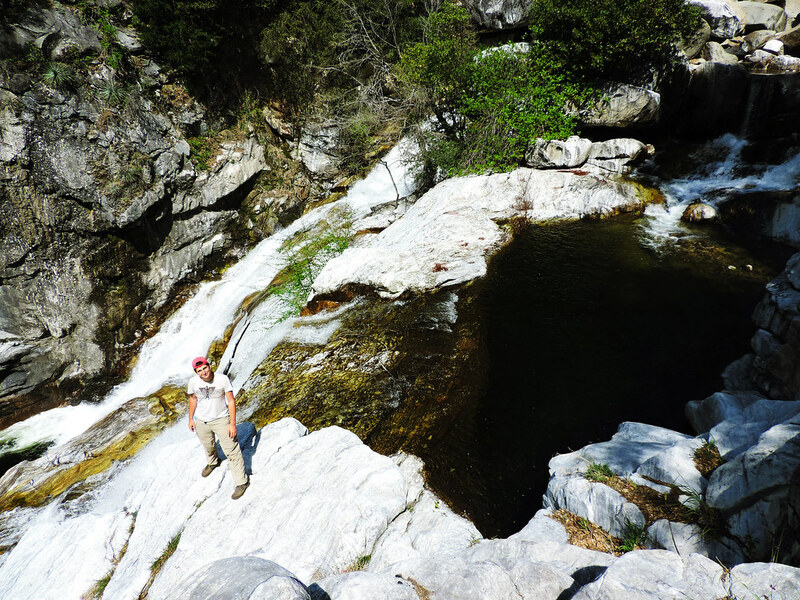 The 80 feet Grizzly Falls is the easiest one to access in Kings Canyon National Park. Its parking lot is not far from the one of Roaring River Falls and Grizzly Falls is right there once you get out of your car. Have we missed anything? What are your favorite waterfalls?